C. Mae Design has an impressive resume—they’ve grown 80% every year since their start in 2014. They also have a 5 star rating across the board on Facebook, Wedding Wire, The Knot, and Google. Not bad for a business run by a former graphic designer who received a camera for Christmas one year and decided to run with it! 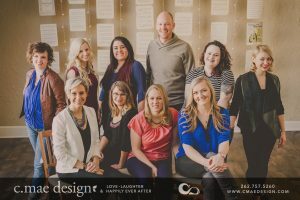 Based out of Burlington, C. Mae Design tackles projects both in the area and beyond—they’ve provided professional wedding photography for events in Michigan, Colorado, Jamaica, and Mexico. In addition to weddings, they specialize in couple, family, and boudoir photography. They also offer graphic design for projects such as wedding invitations and business logos. gn photography boutique, which will serve as an on-site photography location as well as an office space. Going from an at-home office to 1500 square feet will be an exciting change—and a necessary one, given how quickly the business has grown. Cassandra is supportive of “love, however that looks,” and says it was a “no-brainer” to join the Wisconsin LGBT Chamber of Commerce. In fact, the owner says she would love to be more specific to the LGBTQ demographic. She knows it can be difficult to find photography vendors who are queer-friendly—In Burlington, for example, two of C. Mae Design’s major competitors have not been supportive of LGBT equality. high level business leaders (she was seated next to the President of MIAD and a representative of Crowne Plaza Milwaukee), and she left feeling excited and empowered. Overall, Cassie says that what C. Mae offers is unique not just because of the business’ support of LGBTQ clients. Her style is authentic, fun, and intimate: The pictures that result aren’t the “smile and look at the camera” kind—they capture people, relationships, and events for the best parts of what they are.